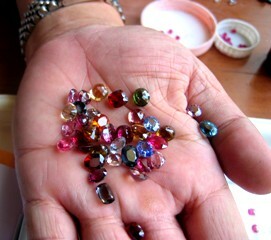 Some varieties like topaz, ruby or sapphire cost only a fraction when treated. If you are new to buying stones on the web, you might wonder why apparently similar looking stones are marked with completely different prices. Compared within one company, the reason will most likely be that the gem photo does not show the stone's true beauty or else hides its flaws. An honest web dealer will set his price based on the stone and not its photo. However, a price will also be influenced by the sellers future expectations of the stone's value, his personal taste and the current demand for a particular variety. If you compare prices between companies, especially on an international basis, the differences might be even bigger. The cost structure on Fifth Avenue NY is different from that of a suburb of Bangkok (which does not mean NY traders sell too high but they offer a completely different service level). Some old time traders have discovered the web as a channel to sell off their bad leftovers. Some are said to use sample photos instead of actual ones. As a rule, never buy without certificates (third-party, not self-made, mind you) and sufficient inspection time. Some companies charge extra for transport, insurance, certificates, listing etc. and you might end up paying double prices per carat before the stone is finally at your door. See our "No Extra Fees" policy. EBay is notorious for $10 offers on stones that the sellers claim have a declared market value of $1000. Why should someone sell a $1000 stone for ten dollars, unless he is really desperate - which wouldn't give him time for EBay anyway? You might sometimes find an undervalued bargain on EBay (if you know more than the seller), but you will definitely not get a fine sapphire for $10. If that were so, nobody would be working anymore, let alone mining. Nobody will sell significantly under value. In the gem trade as much as (or even more than) anywhere else the old rule applies: You only get what you pay for! "People sell gems for $2.99 on the Internet! What is wrong with them?" Simple: Those are not gemstones. They are synthetics, glass or industrial grade rough sold at "cutting costs". Today there are more good gem photos than good gems on the market. We don't color enhance or brighten or darken our photos. Our photos are made with a "normal" Nikon 5400 and every stone is shot individually. We never re-use old photos. Three shots of the same seven carat chysoberyl. the left photo and mention a stronger green in the comment. Gems are not an investment that can be bought and quickly resold for profit. Whoever says so is either badly informed or not honest. Generally untreated gemstones easily hold up with inflation and add one or two percent. Some varieties become fashionable and beat any investment fond, but you have to know which one. This is much easier than on the stock market but still you have to be on the watch. However, gemstones are highly concentrated and mobile valuables. In accounting terms or at customs, they actually come under "cash equivalents". This is true only in regard to a gems' portability, but in terms of cash-flow they can better be compared with real-estate. One might sell a gem at any time, but to get a good price you will have to find a buyer who wants exactly what you have. If you are not only attracted by the beauty of gems, but by their value potential, stay away from the highly fashionable and already expensive varieties like pads, pinks or rubies. 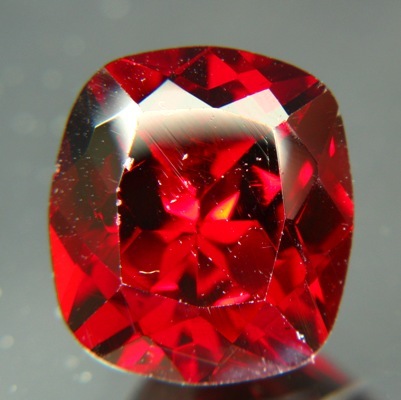 We invest in garnets, spinels, off-color sapphires and chrysoberyl. They will gain value even short- to midterm and will surely make an excellent heritage for the next generation. Untreated ones only, of course.